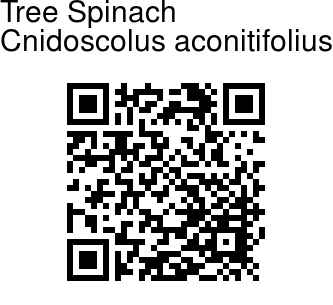 Tree Spinach is a large, fast-growing leafy perennial shrub that is believed to have originated in the Yucatán Peninsula of Mexico. 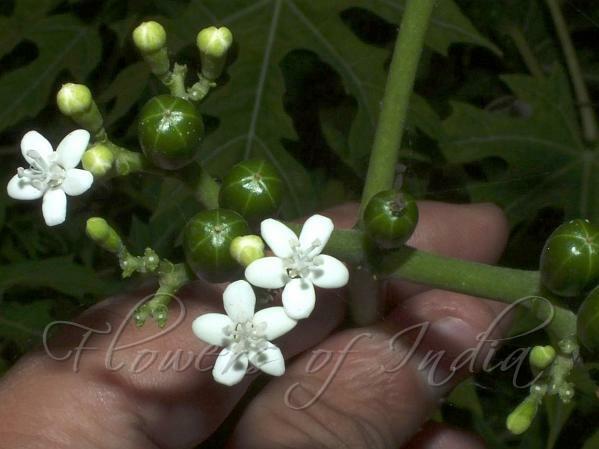 It has fleshy stems which exude a milky sap when cut. It can grow to be 6 m tall, but is usually pruned to about 2 m for easier leaf harvest. Leaves are alternate, simple, carried on stalks 10-30 cm long, glandular at tip. Lead blades are very variable, 10-20 cm x up to 30 cm, shallowly or deeply 3-7-lobed, heart-shaped at base, rather thick and fleshy when fresh, nearly hairless and normally without stinging bristles, lobes pointed to tapering. Flowers are borne in dichotomous cymes. Flowers are unisexual, regular, without petals; sepals 5, up to 1 cm long, looking like petals, white; male flowers with 10 united stamens in 2 whorls; female flowers with superior, 3-celled ovary, styles 3, fused at base. Fruit is an ovoid-spherical, bristly capsule. It is a popular leaf vegetable in Mexican and Central American cuisines, similar to spinach. The leaves should be cooked before being eaten, as the raw leaves contain a high content of toxic hydrocyanic acid. Up to 5 raw leaves can be eaten a day. To be safely eaten, the required cooking time is 5-15 minutes. Medicinal uses: The plant is said to have many medicinal benefits, ranging from the ability to strengthen fingernails and darken greying hair. It is also used to cure alcoholism, diabetes, insomnia, skin disorders, venereal diseases, gout, scorpion stings and to improve brain function and memory. Identification credit: Nidhan Singh Photographed in cultivation in Panipat, Haryana.